By Mustaza Mustafa in Social Media. Updated on November 8, 2018 . Twitter is a social platform crowded with real-time data that moves so fast, you are most likely going to miss information that is important to you. There are however a number of ways to find out the most trending topics or news on Twitter within the Twitter site or by using third-party web applications. There is also that added feature of finding out how people reacted to tweetfeeds, particularly yours. Having a tool to convert all this information into presentable graphs would be ideal. This is where Vizify plays a role. 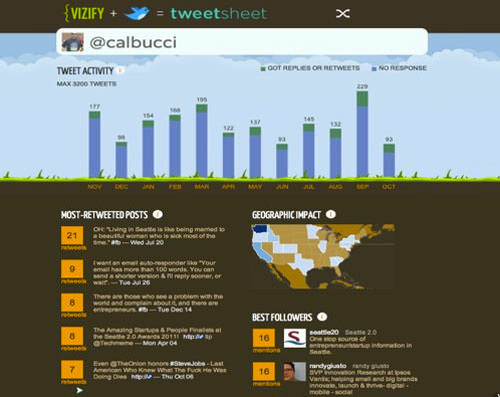 Vizify is a twitter tool that make it easy for you to turn your Twitter data into an infographic that displays your most retweeted posts, best followers, your tweet activity and how your tweets impacted followers geographically. 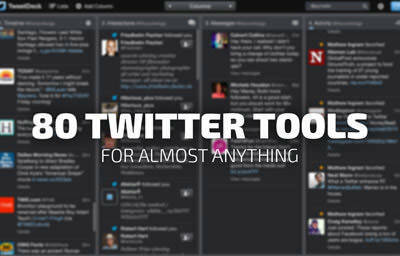 To get your own Twitter infographic, visit the Vizify Tweetsheet page and click on the “Get Your Own” button. 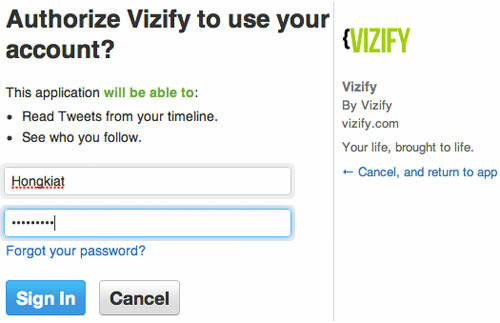 Twitter will prompt you to authorize Vizify’s access to your account, so they will be able to crawl through your data and turn it into an infographic. Once authorized, your Twitter infographic will appear promptly. The twitter infographic may look simple but the data shown could help you understand more deeply the impact you have on your followers. The ‘Tweet Activity’ shows how much you have tweeted previously (Twitter only allows Vizify to crawl through a maximum of 3200 tweets at any one time) and how many of them get replies. 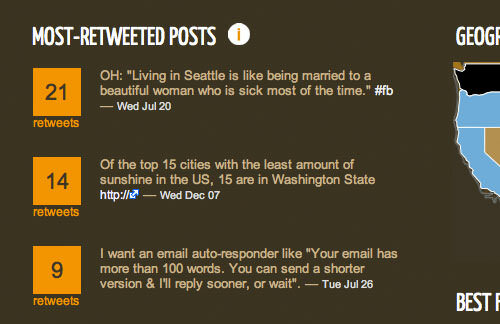 The ‘Most-Retweeted Posts’ will help you identify what type of tweets are highly likable so if you want to reach more audiences, perhaps this can be useful. 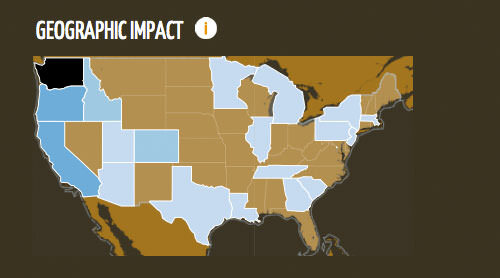 The map on your infographic will visualize your Twitter geographical impact. It tells you the location of the people who mention you the most; the darker the color means more mentions from that place. 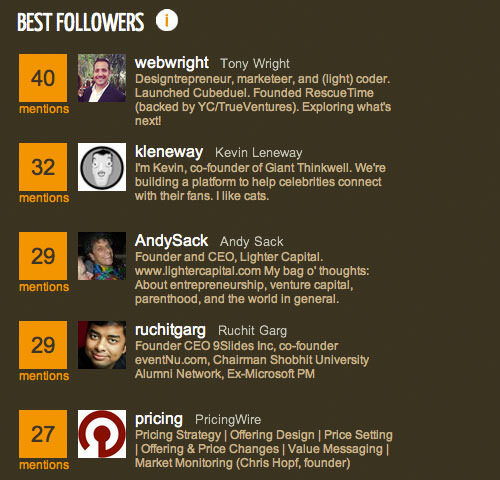 There is also the ‘Best Follower’ infographic where you will be able to see who mentioned you the most on Twitter. This is derived from your conversation tweets with your buddies, or retweets (RT) done by any one of your followers. 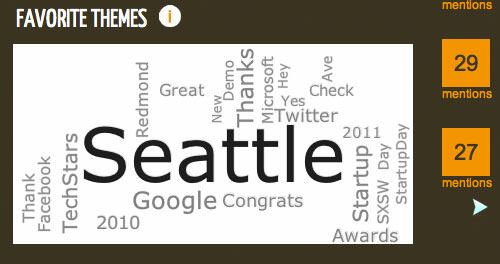 And last but not least is the ‘Favorite Theme’ which will tell you the keywords mentioned most in your previous tweets. You may not notice it, but almost every tweet you make leaves some characteristics that can be measured. Personal marketing has become quite common these days. With every businessperson trying to market their own product, or attract audiences for one marketing purpose or another, the data provided in this infographic could help them, and you, to reach or gain more audiences through proper impact study and analyses of tweets. Although the data provided is not in detail, it is still useful to corporate companies or businesses that are in need of measuring client or customer engagement. And if gaining more audiences does not really matter to you, at least the ‘Best Follower’ feature will let you know that someone out there cares about your tweets.